Metal outdoor benches can provide visitors with a convenient location to take a rest whether it’s in a park, garden, deck, or on a sidewalk of a busy street. The strong and study materials can withstand harsh weather conditions and don’t require expensive and hour intensive maintenance. Customization options are available on certain metal benches to give you the opportunity to advertise your company in a high traffic area. Whether you’re looking for a deck bench, park bench, or garden bench you will be able to find the exact design you want to achieve the desired look. Customized roll form benches allow you to advertise your company’s logos or to have words displayed in steel on the bench back. Galvanized steel with cast iron legs are coated in a durable and weather resistant finish in 16 color choices. 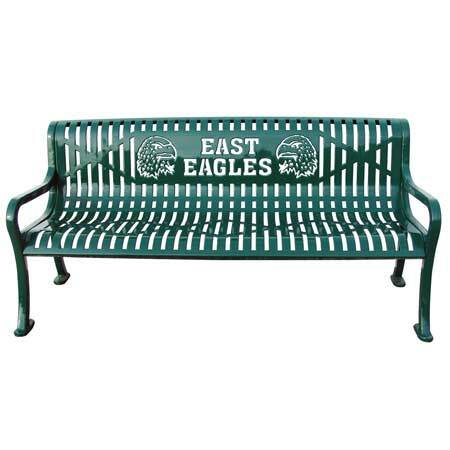 Customized wire mesh benches can also be found that proudly display logos or text for your city, school, or business. Different varieties let you to choose three different mounting options: surface, portable, or in-ground. You can select where you want the bench to sit and feel comfortable knowing it’s doing its job by taking care of visitors. Diamond metal benches use heavy duty steel with cast iron legs and come with pre-drilled mounting holes. This allows for quick installation without the hassle other benches can bring. The weather resistant Thermoplastic finish comes in 16 colors so you can choose which works best with the surrounding environment. You have the option of four, five, or six foot lengths so you can decide which fits in the amount of available space. No matter where you need to install a bench, there will be a size that fits the sport. The Northgate commercial outdoor park bench includes convenient arm rests and a straight back. Steel bench straps promote use for many years while the cast iron legs with pre-drilled holes give you a product with an easy installation process. You have four sizes to choose from and 16 color choices that come from a durable Thermoplastic finish. Your park will thrive by having a bench that is easily seen by pedestrians yet blends in with the environment to avoid causing an eye sore. Wire mesh player’s benches are made with heavy duty metal and a black powder coated galvanized steel understructure. You have a variety of sizes and mounting choices to customize the look of your playing field. The Thermoplastic finish comes in 16 colors, so you can easily select your team’s color to show support. 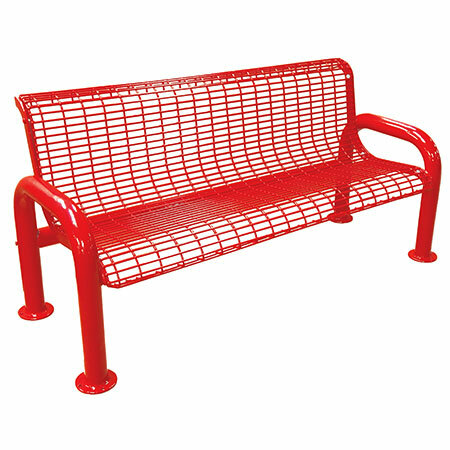 U-leg wire mesh outdoor benches are also available. These are a backless structure that can be bought in various lengths and colors. 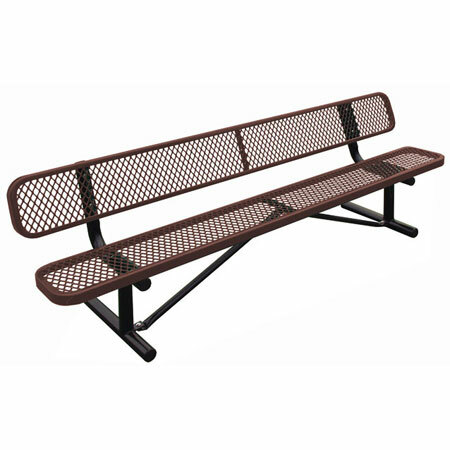 Perforated roll formed metal benches are perfect for the outdoors by providing visitors with a sturdy seating area that is comfortable and resistant to the harsh weather. Choose from 16 colors, ranging from red to black to yellow. The perforated steel bench and cast iron legs with pre-drilled legs are built to be strong and long-lasting. Any garden, park, or school can easily incorporate the look of a perforated metal bench. 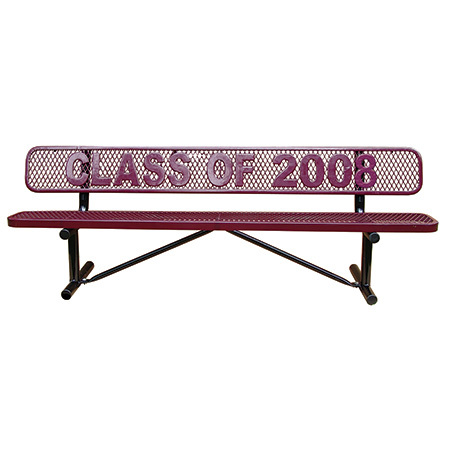 Commercial steel outdoor remembrance school logo park benches are ideal for any type of school campus. We offer many types of outdoor furniture at factory direct pricing. Our commercial metal lobby and entry way benches are used in public places of business, education, transportation, and governance. 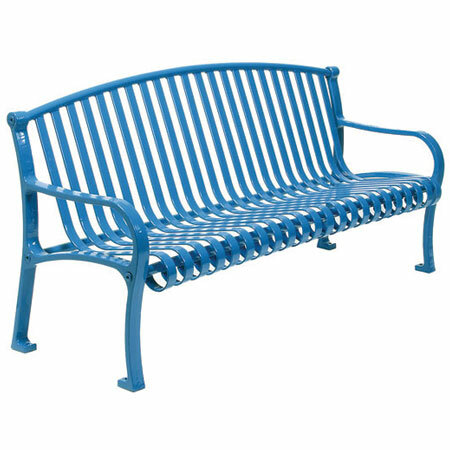 We offer a complete line of Commercial Metal Lobby and Entry Way Benches at low factory direct pricing. There are a number of reasons to invest in metal benches. They are far more durable than wood. They are also much more comfortable to sit on. 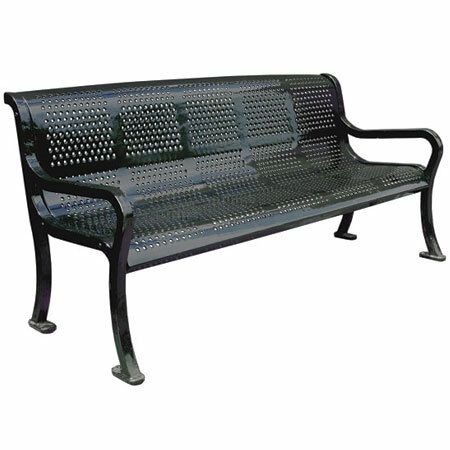 We carry a large selection of metal benches at factory direct pricing. Commercial advertising bus stop benches feature a number of advantages that deliver sure, tangible benefits to a wide range of facilities. We offer factory direct discount pricing. Park benches for municipal planning projects offer civil engineers a wide range of choices that can be used to aesthetically compliment an enormous range of urban environments typically found in any American city. XPB Locker supply has wooden park benches for sale that will contribute an austere sense of elegance to your establishment. We don’t have to abandon practicality, either, in our efforts to create more beautiful environments. Bench seats look good in any area. There are many different design styles. Some have backs, and some do not have backs. Most are made out of metal, but there are wooden benches for places where a distinctively natural touch is needed. Outdoor furniture benches are industrial-strength benches used by schools, office parks, municipal parks, atriums, theme parks, rest stops, train stations, bus stops, shopping malls, and common areas near public buildings. Memorial park benches commemorate the life of an individual. This individual can be anyone that a community esteems as having been iconic of virtue, heroism, sacrifice, faith, or astounding success. The reasons for commemorating people are as many and varied as the people themselves. Commercial park benches are industrial-strength benches that office parks, municipal parks, rest stops, school playgrounds, water parks, theme parks, and even public sidewalks use for multi-person seating areas.